Spier Arts Trust values the cultural contribution of art to South Africa’s economy, the well being of the people and community cohesion. Our purpose is to facilitate successful art careers by enabling freedom of creative expression with the potential for social transformation. Our business model is one of shared value; our patron partners are committed in a long term strategy to realise economic business goals while doing good in society. Spier Arts Academy offers employment-based training in professional Mosaic and Ceramic as art media. This three year, full-time apprenticeship includes tuition in Drawing, Mosaic/Ceramic Theory, Art History and Business Skills. The Academy provides a vibrant learning environment that explores these art forms and develops the practical and technical expertise and creative spirit of all learners. The programme is designed to create a local industry with sustainable and meaningful employment for skilled artisans. Spier Arts Academy practices collaboration between fine artists and artisans, harnessing personal empowerment and contributing to equitable co-existence. In the co-creative process, resources are negotiated in a way that allows the different voices to be heard, while engaging in power and relational dynamics. This process has the potential to affect personal transformation and social agency. In the wake of the completion of his acclaimed sculpture of Nelson Mandela, a new work by Marco Cianfanelli was installed at Spier wine farm in August 2012. 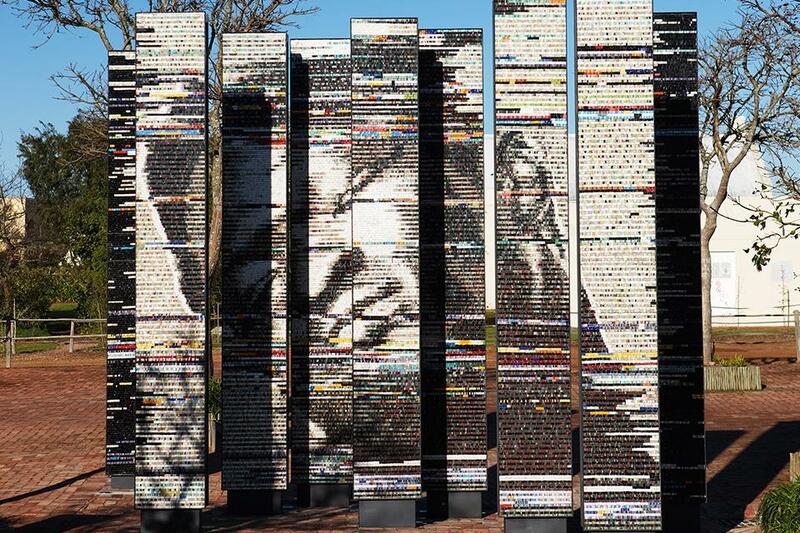 Like the Madiba piece, this work features columns that together create the completed picture. Nine columns measuring 4.1 metres in height cover an installation area of almost 30 square metres, and together form the image of the 'The Dying Slave'. The work was created in mosaic by artists from Spier Arts Academy and marked the first outdoor, three-dimensional piece produced by the studio. 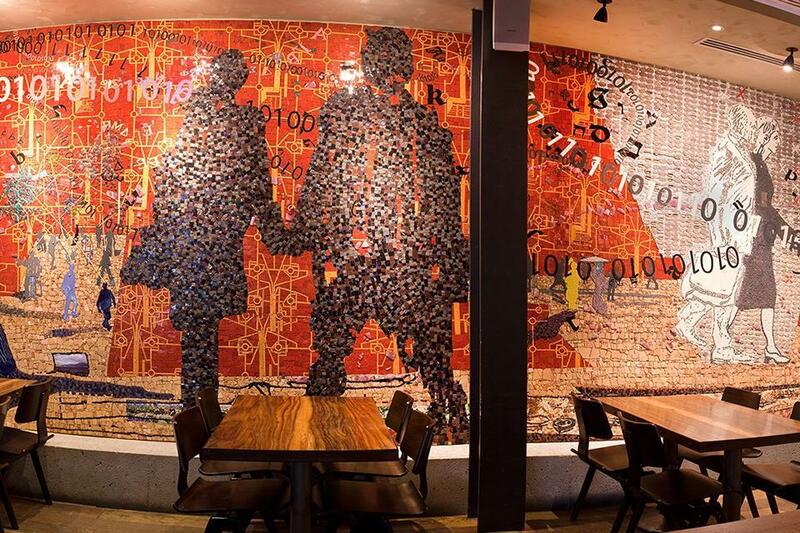 The Wayfarer by iconic South African artist Conrad Botes is a site-specific, mosaic artwork commissioned by Telesure and realised by mosaic artisans from Spier Arts Academy. The 78 square meter surface of The Wayfarer is constructed with 2.8 tons of material, which include travertine, limestone, granite, pebbles, marble, bricks, industrial glass, porcelain, handcrafted ceramic elements and Venetian glass. 14 mosaic artisans worked for 8 months to complete the work. Colourful, contrasting and ever-evolving, the Creative Block collection is the result of a one-of-a-kind art initiative. Each unique Creative Block artwork represents one of more than 250 participating artists; their individual stories,subject matter and style. But it’s when they’re displayed together that they create something magical – a rich and striking expression of South African art. Qubeka is a fine art beading studio owner-managed by three dynamic artists and business women. What started as simple idea – to collaborate and interpret the work of some of South Africa’s finest artists in beaded panels, has grown to become an inspiring, unique art expression. Today, Qubeka Bead Studio collaborates with some of our country’s leading artists to translate their works into beautiful beaded creations. Qubeka means the continuation in Xhosa. And a Qubeka artwork, in all of its colour, intricate detail and delicate grandeur, represents just a little something of the artist’s personal joy and passion and the beautiful story each continues to write. Spier believes that the visual arts challenge us to take a fresh look at our world and environment. Art it is a powerful tool for transformation that is shared with guests and staff on the Spier estate, and art enthusiasts all over the world. Passionate about the arts, Spier displays a significant collection of contemporary Southern African artwork on the estate in Stellenbosch. Nando’s was founded in 1987 in Johannesburg, South Africa, which remains the cultural heartbeat of the brand. The Art in the restaurants is an expression of this culture. By exhibiting original art from their cultural heartbeat in restaurants, they believe that they are democratizing art by making it accessible to anyone visiting their restaurants, while telling the story of their beginnings. Nando’s ambition in art is to change lives and make a real difference to Southern African artists and their families by providing career development opportunities and exposure. Since 2002, in a close shared value partnership with Spier Arts Trust, Nando’s has been enabling career development opportunities for artists. By allowing artists to focus full-time on their artistic careers with the potential to earn a regular income, Nando’s is making a difference in people’s lives while at the same time growing their body of high quality Southern African contemporary art. Nando’s houses one of the largest contemporary Southern African bodies of art publicly exhibited in the world, each piece an original work. By sharing the artists’ stories, they are sharing their own story. By showcasing the artists’ work globally in their restaurants, they are sharing a significant period in Southern Africa’s history with the rest of the world.